While the big hopper spreaders get all the glory, the FISHER® SPEED-CASTER™ 900 tailgate spreader ensure a great finish. 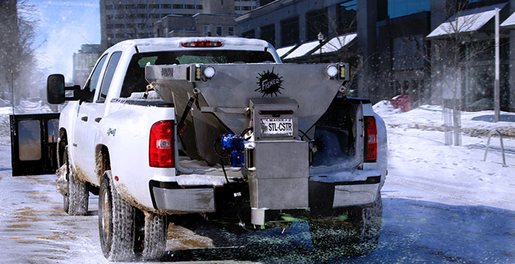 Featuring 2-stage, auger-fed delivery systems that can handle salt, sand or a sand/salt mix, and mounting systems for pickups, SUVs and tractors, these tailgate spreaders deliver exceptional performance in any conditions. While the big hopper spreaders get all the glory, the FISHER® SPEED-CASTER™ 525 tailgate spreader ensure a great finish. Featuring 2-stage, auger-fed delivery systems that can handle salt, sand or a sand/salt mix, and mounting systems for pickups, SUVs and tractors, these tailgate spreaders deliver exceptional performance in any conditions. For the ultimate in convenience and performance, this line of Low Profile Tailgate Spreaders provides a clear view from the cab. Low Profile Spreaders are ideal for spreading #1 rock salt, calcium chloride and other de-icing materials. So when you’ve got slippery driveways and parking lots to control, and you don’t want bulky spreaders blocking the view, the difference is clear with FISHER. Have limited spreading needs, but still want to get the job done right? The FISHER® POLY-CASTER™ LT 0.5 cu yd poly hopper spreader provides professional spreader performance in a compact package, perfect for smaller area spreading needs. Handles 50/50 sand/salt mix or bulk salt. The POLY-CASTER LT Spreader provides top spreading performance for UTVs and pickup trucks. In order to better serve our customers needs, Quality Equipment has Fisher Sub Dealers located around the state: More dealer locations to come!